Market Development: selling more of the company’s existing products to new markets. This strategy is about reaching new customer segments or expanding internationally by targeting new geographic areas. Product Development: developing and selling new products to existing markets Product development means making some modifications in the existing products to give increased value to the customers for their purchase or developing and launcing new products alongside a company’s existing offering. 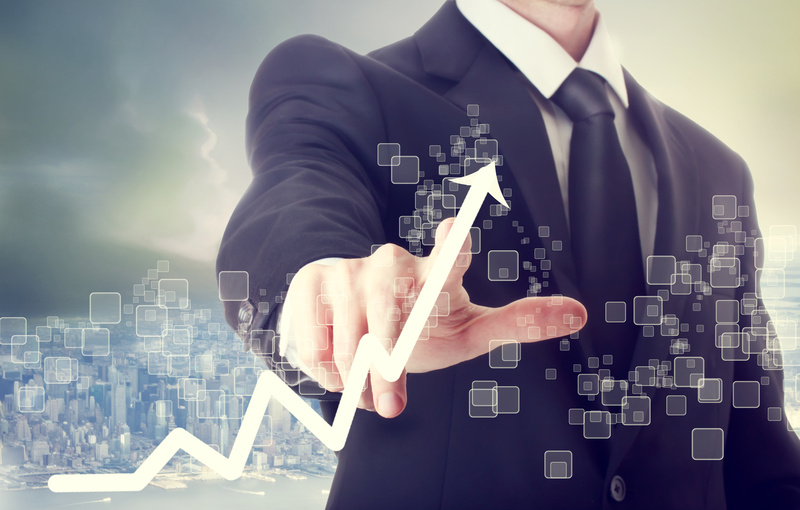 Generally speaking, business growth can be classified into internal growth and external growth. This article will discuss the various growth strategies and explain the differences between them. Internal growth strategies have a few disadvantages. For instance, developing internal capabilities can be slow and time-consuming, expensive, and risky if not managed well. External growth (or inorganic growth) strategies are about increasing output or business reach with the aid of resources and capabilities that are not internally developed by the company itself. Rather, these resources are obtained through the merger with/acquisition of or partnership with other companies. External growth strategies can therefore be divided between M&A (Mergers and Acquisitions) strategies and Strategic Alliance strategies (e.g. joint ventures). Business extension: M&A can be used to extend the reach of a firm in terms of geography, products or market coverage. Consolidation: M&A can be used to bring together two competitors to increase market power by reducing competition; to increase efficiency by reducing surplus capacity or sharing resources, for instance head-office facilities or distribution channels; and to increase production efficiency or increase bargaining power with suppliers, forcing them to reduce their prices. Building capabilities: M&A may increase a company’s capabilities. Instead of researching a new technology from scratch, for instance, acquirers may wait for entrepreneurs to prove an idea and then take them over to incorporate the technological capability within their own portfolio. Speed: M&A allows acquirers to act fast—and this may be an advantage in itself, wrong-footing competition and changing the industry landscape faster than competitors can evolve in response. Financial efficiency: This may allow a company with a strong balance sheet to combine with another company with a weak balance sheet, enabling the latter to save on interest payments by using the stronger company’s assets to pay off its debt. The acquired firm could also access investment funds from the stronger company that were otherwise unavailable. Tax efficiency: For example, profits or tax losses may be transferable within the combined company in order to benefit from different tax regimes between industries or countries, subject to legal restrictions. Asset stripping or unbundling: Some companies are effective at spotting other companies whose underlying assets are worth more than the price of the company as a whole. This makes it possible to buy such companies and then rapidly sell off (unbundle) different business units to various buyers for a total price that is substantially in excess of what was originally paid for the whole. Although this is often dismissed as merely opportunistic profiteering (asset stripping), if the business units find better corporate parents through this unbundling process, there can be a real gain in economic effectiveness. Mergers and acquisitions bring together companies through complete changes in ownership. However, companies can also share resources and activities to pursue a common strategy without sharing in the ownership of the parent companies. There are two main kinds of strategic alliance: equity and non-equity alliances. Equity alliances involve the creation of a new entity that is owned separately by the partners involved. The most common form of equity alliance is the joint venture, where two companies remain independent but set up a new company that is jointly owned by the parents. Alliances can also be formed with several partners, and these are termed a consortium alliance. Non-equity alliances are typically looser, and do not involve the commitment implied by ownership. Non-equity alliances are often based on contracts. One common form of contractual alliance is franchising, where one company (the franchisor) gives another company (the franchisee) the right to sell the franchisor’s products or services in a particular location in return for a fee or royalty. McDonald’s restaurants and Subway are examples of franchising. Licensing is a similar kind of contractual alliance, allowing partners to use intellectual property, such as patents or brands, in return for a fee. Long-term subcontracting agreements are another form of loose non-equity alliance, common in automobile supply. Strategic alliances allow a company to rapidly extend its strategic advantage and generally require less commitment than other forms of expansion. A key motivator is sharing resources or activities, although there may be less obvious reasons as well. There are four types of alliance: scale, access, complementary, and collusive. Scale alliances involve companies combining to achieve necessary scale. The capabilities of each partner may be quite similar, but together they can achieve advantages that they could not easily achieve on their own. Thus, combining together can provide economies of scale in the production of outputs (products or services). Combining might also provide economies of scale in terms of inputs—for example by reducing purchasing costs of raw materials or services. Access alliances involve a company allying in order to access the capabilities of another company that are required to produce or sell its own products and services. For example, in countries such as Mexico a Western company might need to partner with a local distributor to access effectively the national market for its products and services. The local company is critical to the international company’s ability to sell. Access alliances can also work in the opposite direction, with a local company seeking a licensing alliance to access inputs from an international company—for example technologies or brands. Complementary alliances involve companies at similar points in the value network combining their distinctive but complementary resources so that each partner is bolstered where it has particular gaps or weaknesses. The Renault-Nissan Alliance is a great example of two companies combining their strenghts to overcome their individual weaknesses. Collusive alliances involve companies colluding secretly to increase their market power. By combining into cartels, they reduce competition in the marketplace, enabling them to extract higher prices from customers or lower prices from suppliers. Such collusive cartels among for-profit businesses are discouraged by regulators. For instance, mobile phone and energy companies are often accused of collusive behavior. There are many potential advantages of external growth through acquisitions and alliances. Down below there is a list of some of these advantages compared to internal growth depeding on the nature of the acquisition/alliance. 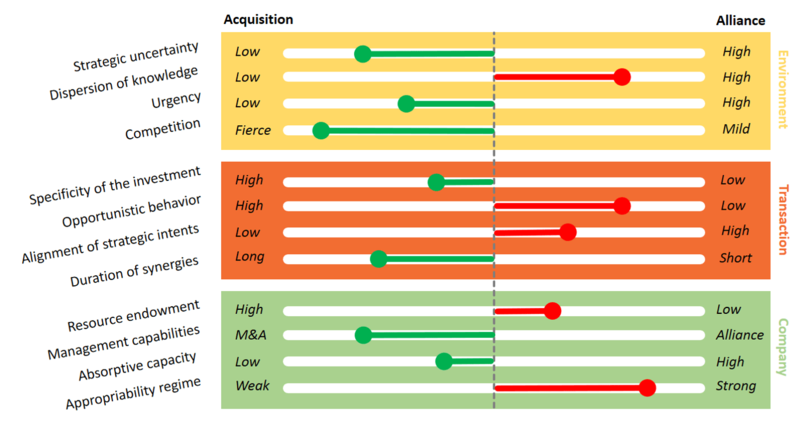 For a more systematic way of choosing between acquisitions and alliances themselves, you may want to read more about the Acquisition-Alliance Framework. In sum, growing a company can be done in many different ways. The most used ways are internal growth or external growth through acquisitions and alliances. 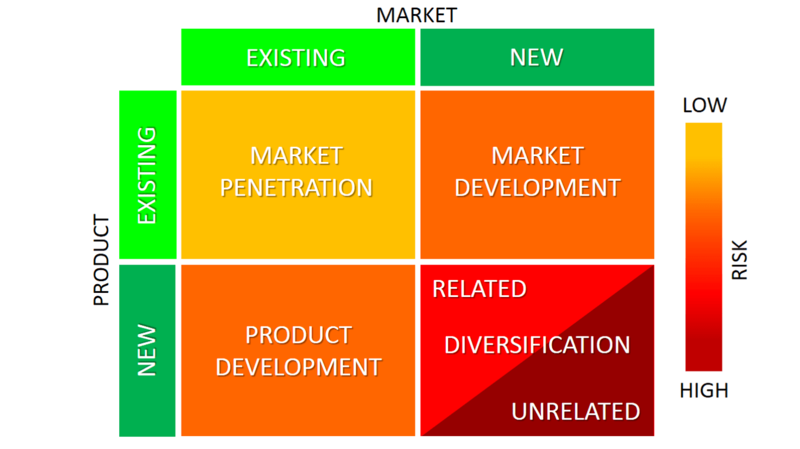 The Ansoff Matrix is a great tool to map out a company’s options and to use as starting point to compare growth strategies based on criteria such as speed, uncertainty and strategic importance. Ansoff, I. (1957). Strategies for Diversification. Harvard Business Review. Dyer, J.H., Kale, P. and Singh, H. (2004). When to ally and when to acquire. Harvard Business Review.